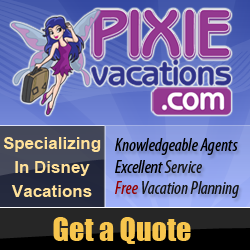 We have some incredible Pixie Vacations offers available if you are thinking about a Disney vacation. This post will outline some of the great deals you can find, as well as give you the opportunity to get a quote created just for you, so take a look at what we’ve got! Are you interested in our Summer Kick-Off Special? The travel dates for this package are May 23-29, and you must stay on May 27th. If you are interested, we need to book this by April 23rd, so act now! A sample package – 6 nights at Port Orleans Resort – Riverside, for 2 Adults and 2 Children (ages 6 and 8), six days of Magic Your Way park tickets, and the Disney Dining “Plus Dining” option is $3,082.91. Normally, this package would cost you $3,532.06, so you are saving $449.15! We also have a special Star Wars Weekend package available for you! Travel dates for this package are June 6-12, and you must stay on June 9th. The beauty of that weekend is that Billy Dee Williams will be participating in the Star Wars Weekend June 7-9, 2013, so it may be just the chance you need to meet Lando Calrissian! Use the quote link below to get pricing for this offer, which needs to done by May 8th, 2013! Are you interested in seeing Walt Disney World for the 4th of July? Then have I got the deal for you! Book your vacation by June 1st, stay at Walt Disney World between July 1-7, 2013, with a mandatory stay on July 4th, and the savings may be more spectacular then the special Independence Day Fireworks at the Magic Kingdom! We’ve also got special deals for the Friday, September 13th Villains Weekend, special deals for the Food & Wine Festival in October, Jersey Week in November, and of course, special holiday savings in December. Hit me up if you would like more information on any of those specials! To request a personal quote for these or any Disney travel plans that you have, please click on the image and fill out the vacation request form! It will generate an email to me, and I’ll get right on it! Thanks, and have a Magical Day! Save up to 30% on Walt Disney World Resort stays with Disney Visa! What would Free Disney Dining Plan mean to you? Free Disney Dining Released to the General Public! Enter to Win from Pixie Vacations! Friendship Friday: My Pixie Friends! Previous Post: 70 Days til Disneyland – Storybook Land Canal Boats!